It’s about time I dedicated a post to one of the best & most inspiring books I’ve read in so very long. Based on the cover alone (which is just so adorable and too too chic) you wouldn’t realize its life changing possibilities. But it is. Life Changing. Im sure its also very apparant from my previous posts on this blog that Paris is my jam. I have a dedication that borders on the ridiculous for anything that is reminiscent of my love of Paris and all things French (and yes, Id rather refer to it as a dedication rather than an obsession). Knowing me, I’m sure it is no surprise to you that I would purchase this book, and add it to my growing library of books on Paris and its lifestyle. However no book as of yet has moved me into such action. I have a problem you see. This I would actually call an obsession. So I like things to stay new. Like very new. Like fresh out of the box new. Or more preferrably, for any purchase to actually just stay in its box. Fresh, crisp, brand new, never dulling, fading, getting dirty, loosing its luster, etc, etc, etc. This is indeed a problem I have, and have been struggling to overcome for some time now. It is definitely questionable to most, to see me pull a half used tube of lipstick, still in its package out of my purse. I do this often and with almost all of my possessions. Everything from eyeglass frames, to bottles of nail polish, everything still just as I received it (or as close to as possible). And only after an internal struggle to force myself to actually use it. If it were really up to my obsessive side, everything would get bought and stored away, to stay new for ever. And I would live day to day in my old frumpies and yuckies, because my brand new purchases would have to stay brand new until just that ‘perfect’ time. Im not sure when that perfect time would be… perhaps after I’ve reached that perfect weight, or when I’m at my best weight and my hair is at the most perfect length. Or perhaps its all of this, and when I’m living my best life, with the man of my dreams, living beautifully and peacefully in Paris. But yes, its this pursuit of living MY BEST LIFE that is causing me to disregard the me of today, who actually is living a fairly lovely existence, although certainly not perfect. Its not often that one reads a non self help book (and I do not consider this gem a self help book, although as you will soon see, it has proven very helpful), and to realize so much about yourself. Such as; although I have the luxury and flexibility to work remotely from home, I do not allow myself to get comfortable and enjoy my surroundings. I could get through a work day, with my lovely classical music playing in the background, and my favorite candle lit. But I can’t for some reason be carefree and just live in the moment, to relax and chill and savor my life even when I am working. How much time have I wasted away, allowing myself to believe that if the moment isn’t perfect, I shouldn’t cherish it? That if the moment isn’t just right, that I shouldn’t make it the best I can? I deserve to make my life beautiful. If I’m having a bad day with work it should not stop me from having a good day overall. Im changing my ways though. And it all started last winter, tucked away at home, reading the words of Jennifer L. Scott. I knew this book would be a keeper. What I didn’t know was how many copies I would purchase and gift away to help spread her words. 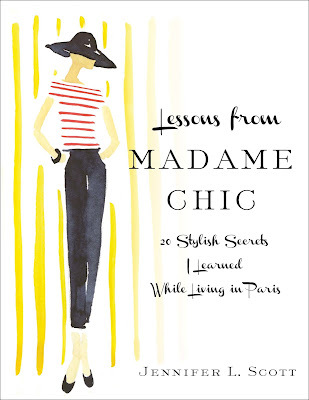 Lessons from Madame Chic, indeed. Her lessons taught me to enjoy my life, to enjoy my life everyday, and in all its moments. So profound huh? Not really though. Why did it take a word from the wise (or the French) to realize that we don’t have to save luxury for the special times. We can make today that special time and use what we have that is our best to celebrate ourselves. Its really such a beautiful message; live your life, enjoy your life, spend your days listening to your favorite music, instead of telling your self you cant enjoy the music until all the work stops, or until all the stress and worry is out of your life. So thank you Jennifer. Thank you so much. Without your book I would still be living as if the me of today isn’t worthy to enjoy the pleasures I had saved for the me of tomorrow. Without your book I would not take the time to enjoy the simple comfort of sitting in my rarely used front room, drinking coffee and watching the blue sky out of my panoramic windows. Without your book I would allow my treasures to sit unused, wasting away until all its specialness, had aged away with time. You’re writing is exquisite. Through you’re words I can tell this book has touched you and has left a lasting impact. Although I am not an author myself, I would imagine that would be every authors purpose…to touch ones spirit.